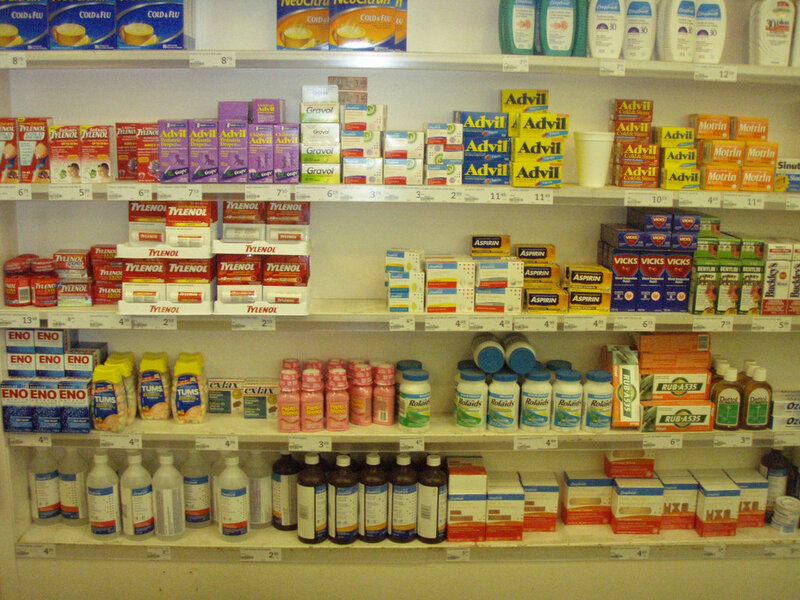 A typical sight behind the drug counter. There are wide discrepancies between the numbers, because the FDA doesn’t necessarily demonstrate a causal relationship between a person’s death and a particular drug, just an association. The other problem is that, as paracetamol is such a commonly-used drug that is often used in combination with other drugs to potentiate their effects, e.g. ibuprofen and acetaminophen, Vicodin (acetaminophen and hydrocodone) and Co-Codamol (codeine and paracetamol). 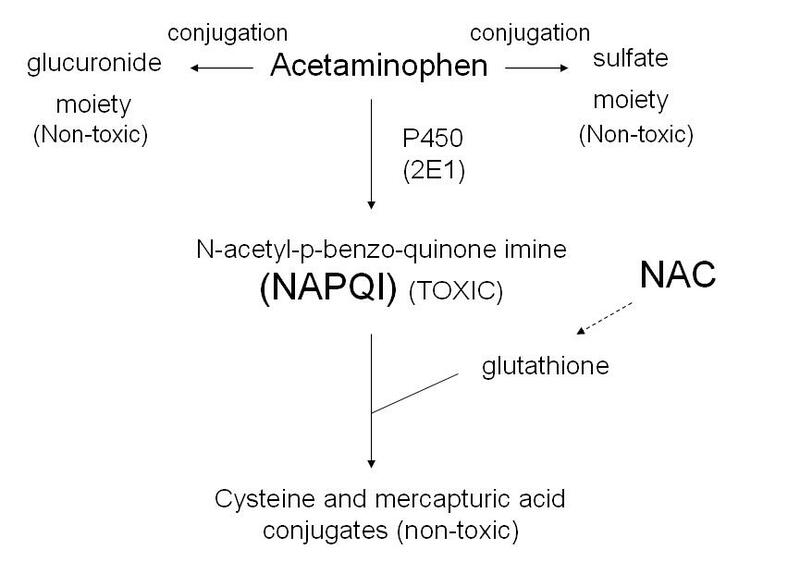 How acetaminophen is metabolized in the human body. Acetaminophen is also quite dangerous when taken in combination with alcohol, which can increase the chances of liver failure. This means that, if acetaminophen was the cause of death (or at least a contributor), it is being “hidden” by other factors. This means that the number of deaths via acetaminophen could be higher than expected. So, is the relatively benign acetaminophen/paracetamol/Tylenol dangerous? Not extremely, but it’s not exactly completely safe, either, especially when it’s taken with other drugs. Of course, another problem is that a person may take a weak opioid, then take Tylenol at some point, and have much stronger effects than expected. Perhaps the real kicker is that, for many people with pain, paracetamol/Tylenol/acetaminophen is not even effective. This leads to an ethical question for many doctors, as they can reasonably ask themselves, “Why should I prescribe this, when it won’t work for most people, and could in fact end up becoming dangerous?” Excessive acetaminophen/Tylenol dosing is also common in hospitals. How does this compare with cannabis? Well, we don’t know all the different cross-reactions between medical marijuana and other drugs due to the lack of research, but we can definitely say that there likely will be. Cannabis, although it can be used to wean and taper a person off of opioids, may well have negative reactions with painkillers like propoxyphene (found in Darvocet, Darvon), buprenorphine (Butrans, Buprenex), buprenorphine (Subutex), and naloxone (Suboxone, which also contains buprenorphine). 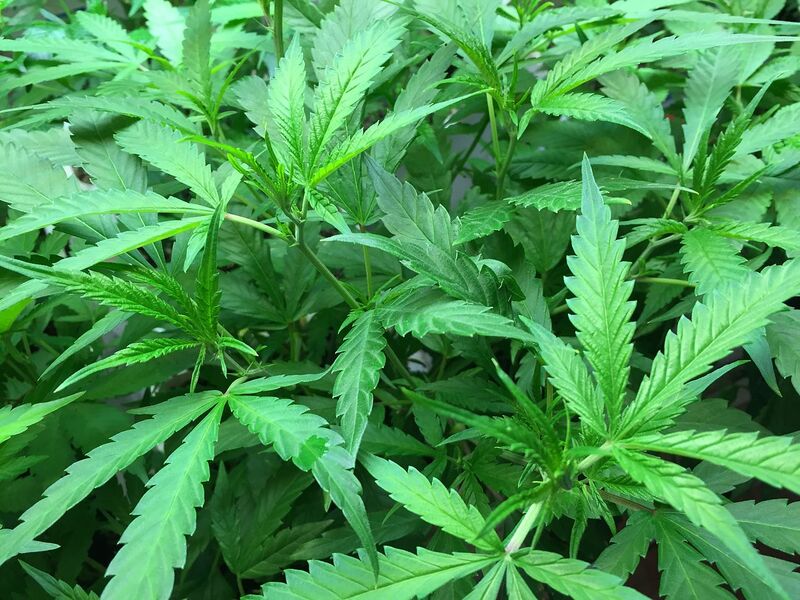 Cannabis also has negative interactions with alcohol, benzodiazepines like clobazam – which is often used for epilepsy, and may have drug-drug interaction as CBD and benzos are both metabolized by the liver enzyme cytochrome P450 – and barbiturates, which may interact with THC (but not necessarily CBD). The reason why cannabis may have a negative interaction with these other drugs is because they are all central nervous system (CNS) depressants, and cannabis may potentiate this effect. Many doctors and pharmacists may also recommend patients avoid other drugs that affect cytochrome enzymes in the body. Patients who cannot metabolize CYP2C9 properly may want to be careful with amiodarone, cimetidine and fluoxetine, as the body may inhibit THC elimination. Meanwhile, rifampin, which is a CYP3A4 inducer, may reduce THC levels. 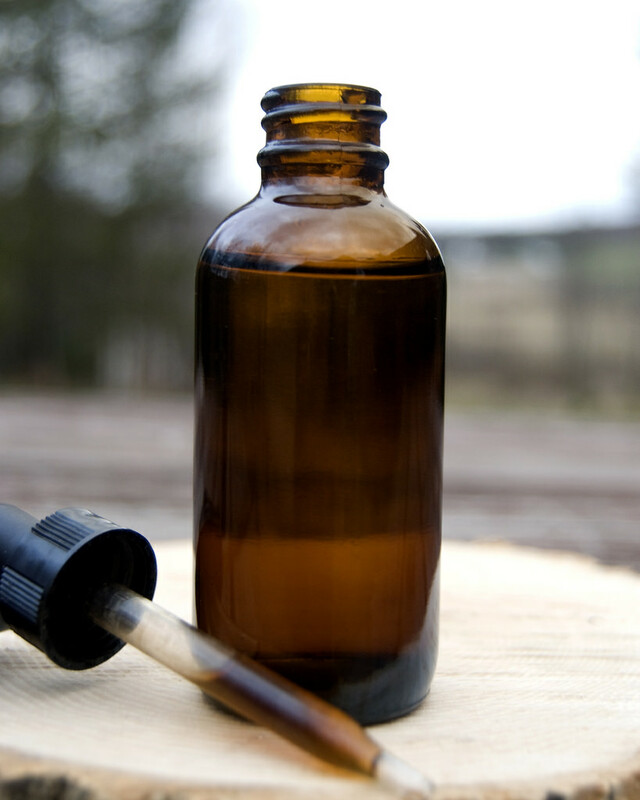 As for cannabidiol (CBD), which is a substrate of CYP3A4 and CYP2C19, may also be inhibited by rifampin, with CBD levels in the blood reduced by 50% or more when ingested alongside CBD. Both THC and CBD may have limited ability to inhibit the activity of CYP450 enzymes. Interestingly enough, smoked marijuana (as opposed to oral administration) has been shown to increase the metabolism of theophylline and chlorpromazine. This suggests that cannabis could be useful as a medication for chronic obstructive pulmonary disease (COPD), asthma, and as an antipsychotic. Interestingly enough, this means that, despite all the potential harms, some people may find more benefit in smoking cannabis. However, we can safely assume that smoking any substance is going to be bad for most people. As acetaminophen is usually orally administered, it is definitely safer than cannabis in this regard. However, acetaminophen use, even when used on its own, has caused overdoses and killed people. Cannabis, on the other hand, has not. OK, so when it comes to the chances of overdose and death, cannabis is clearly safer. But what about other concerns, like mental health? Well, there is some information out there saying that paracetamol may be useful for emotional pain, but there is nothing definite, and there is still the potential of overdose. As for other issues like acute psychosis, there are some case studies associated with psychosis and codeine and acetaminophen, but there isn’t anything definitive. Other studies have suggested that using over-the-counter painkillers may impair the brain’s ability to detect errors. There doesn’t seem to be any major relationship between acetaminophen and mental health issues, but this doesn’t seem to be an area that’s looked at too much. Cannabis and mental health, on the other hand, has an interesting relationship. Although there is no definitive evidence that cannabis is a cause of mental health issues for everyone, it doesn’t mean that it might not be a confounding factors for certain types of mental illness. Those who suffer from or have a family history of schizophrenia, for example, may want to avoid THC (although CBD may be an antipsychotic and be of help for those with schizophrenia). Age may be a factor as well, as early, non-medical cannabis use by adolescents may cause some sort of neurological decline. However, for those who are older, cannabinoids may promote neurogenesis! Cannabis and its benefits and problems with mental health clearly needs to be researched further. So, is medical marijuana safer than acetaminophen? In terms of the potential of getting a fatal overdose, yes. Using a cupboard full of cannabis on its own won’t kill you, whereas a cabinet full of Tylenol and other acetaminophen-containing products could well do if taken in sufficient amounts. On the mental health side, it seems that acetaminophen could be said to be safer, but there isn’t necessarily any evidence proving this one way or the other at the moment. However, comparing one, highly purified, manufactured drug with a medicine that hasn’t been purified and has a number of different cannabinoids, terpenoids and flavinoids doesn’t necessarily seem fair, and we ought to start looking at cannabis’s efficacy vs. other drugs and medications, both when cannabinoids and terpenoids are working together and working separately. This is the only way we’re going to get a true grasp of cannabis’s safety and efficacy profile.